This slow cooker frittata was my first attempt cooking eggs in the crockpot, but it won’t be my last. Made with an assortment of chopped fresh vegetables, this slow cooker frittata makes an easy, healthy and delicious dish suitable for breakfast, lunch or supper. We enjoyed this easy healthy slow cooker frittata with a tossed green salad for dinner. And we warmed the leftovers in the microwave for a quick and easy breakfast the following morning. 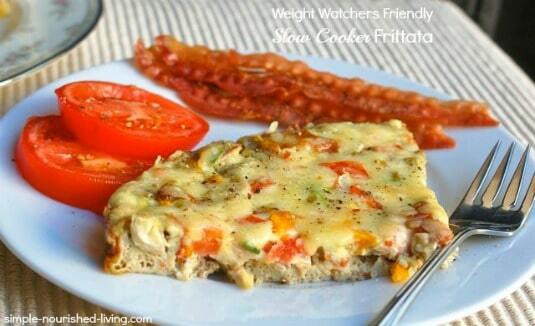 This slow cooker frittata is versatile too. Use whatever vegetables you have on hand. I used a combination of chopped artichoke hearts (leftover from my slow cooker artichoke dip), green onion, yellow bell pepper and tomato. Chopped cooked bacon, sausage or ham would be good in it too. Each serving of this easy healthy slow cooker frittata has 141 calories, 4* Weight Watchers PointsPlus and 1* WW Freestyle SmartPoint. And if you used non-fat cheese or skipped it, I think this would work for Simply Filling too. If you’ve made this frittata, please give the recipe a star (★) rating below and leave a comment letting me know how you liked it. 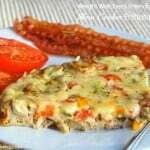 This slow cooker frittata makes an easy healthy breakfast, lunch or supper and can be modified lots of ways. Coat the slow cooker with nonstick cooking spray. Stir together the eggs and vegetables and pour into the slow cooker. Cover and cook on LOW for 1 to 2 hours, or until set. Sprinkle evenly with grated cheese. Cover and turn off the slow cooker. Let sit until the cheese is melted, about 5 minutes. Cut into 4 equal pieces.